Cambrian College's North Bay Campus was a satellite campus of the Sudbury-based Cambrian College of Applied Arts and Technology, and the predecessor to Canadore College. The campus was opened in July 1967 in downtown North Bay in the Queen Victoria School on Worthington Street. Growing enrolment quickly necessitated a move to a larger permanent facility and, following the purchase of land in the northwest part of North Bay, Cambrian College entered into negotiations with three other local colleges (Nipissing College, Saint Joseph's School of Nursing, and North Bay Teachers' College) with the aim of building a multi-college facility. Construction of the new campus facility, known as the College Education Centre, began in September 1970 under the management of Cambrian College. Before moving to the new campus, however, the North Bay Campus was separated from Cambrian College and became an independent college known as Canadore College of Applied Arts and Technology in September 1972. 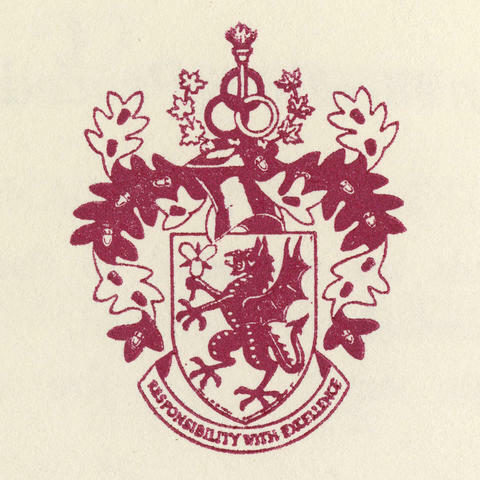 The image linked to this description is the crest of Cambrian College from the title page of the 1968 North Bay Campus convocation program (from File 0214-05 - Convocation programs).